Police informed a man walked into the store and pulled a gun at two staff members. 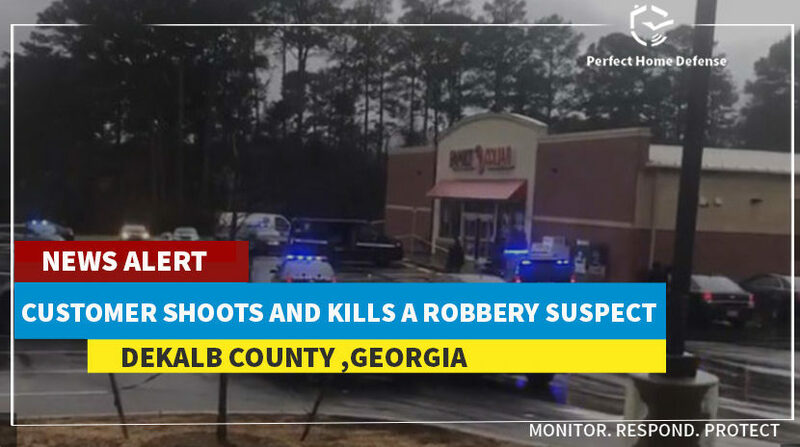 While the suspect was stealing money from the employee a customer intervened and shot the man. The suspect died, the customer who shot the suspect will not be detained said the police. The offices told the clerk was pretty disturbed by the incident but was appreciative about the customer who stepped in and stopped the armed robber. Police hasn’t mentioned the name of the customer who killed the robber and took out the threat. Installing video surveillance cameras will keep your store protected from unwanted burglars. The modern mobile technology allows you to access your surveillance cameras from anywhere and keep your store protected. Burglars prefer to hit on easy targets store. Make sure you show them you have got yourself protected. Put security cameras symbol on the store door or window so they know that someone is always watching them. No matter whether your store is located in a crowded area or a lonely street, make sure you have the best home security system in Georgia. A glass break sensor will keep your store protected. It will trigger an emergency alarm if anyone tries to break in the store and the monitoring team will instantly be notified.